Whilst the players from lower positions at the ITTF rankings already started their journey towards main draw, favorites are still warming up. It is the great opportunity for the journalists to meet with some of the biggest stars in less tense atmosphere. Whilst the players from lower positions at the ITTF rankings already started their journey towards main draw, favorites are still warming up. It is the great opportunity for the journalists to meet with some of the biggest stars in less tense atmosphere. Six times European champion in singles, man who has 18 singles titles at ITTF World Tour, gold at World Grand Finals in 2005 and World Cup in 2002 and 2005, alongside two bronze teams medals at the Olympics, Timo BOLL is in good shape at LIEBHERR World Championships in Paris. He played in the semi final last time in Rotterdam at the World Championships, he recorded his best ever result at the World Championships by reaching the bronze medal. Naturally first question is related to his goals in Paris. “I have very good preparations and practiced very well. I am happy with my current shape, and my expectations are high. But this is the first season after Olympics; first year in Olympic cycles is always very difficult. First aim is to justify my rankings, but I always hoping for medals” said Timo. - You’ve been missing a lot of tournament after Olympics, was it planned like that? 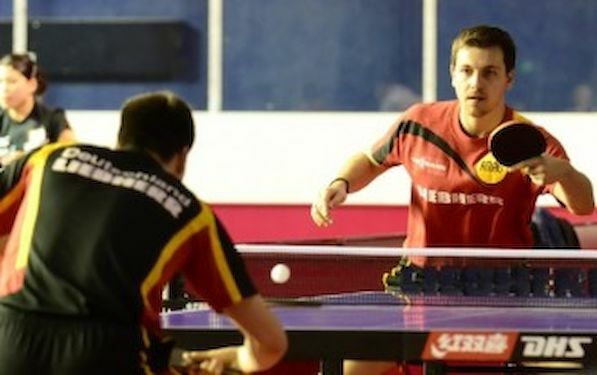 Timo BOLL is China’s main rival. Last time in Rotterdam at the quarter-final stage he defeated China’s CHEN Qi in five games, before losing by the same margin in the penultimate round to the champion elect, CHEN Qi’s colleague, ZHANG Jike. In Paris BOLL will play against the qualifier in the first round whilst in second, according to draw he should meet Sharat Kamal ACHANTA of India. “According to draw Timo and Dima should reach the quarters,” stated coach Jorg ROSSKOPF. In BOLL’s part of the draw are also Jens LUNDQUIST and Korean YOUNGSIK. “I am not kind of player who is very optimistic before the tournament. I am in quite opposite mood. However I think it is much better to start tournament with doubts and in not very bright mood and to conclude it in better light,” said Timo. He is not the only member of the family who is cautious. BOLL’s wife Rodelia “Deli” BOLL, asked only for tickets for Wednesday, when BOLL will play his first match. Only after that match he will ask for the tickets for next day….